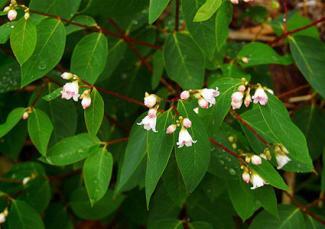 Apocynum is the genus name for a collection of species that are called dogbane or Indian hemp. These plants are native to North America, temperate Asia, and Southeast Europe. Apocynum is from the Greek "away from the dog". All of these species are attractive to butterflies. 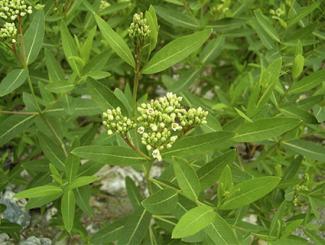 Dogbane contains cymarin, a drug used to control irregular heartbeat in humans. Until 1952, it was listed in the medicinal text United States Pharmacopoeia. Dogbane is now considered to be poisonous because of its toxic side effects and the danger of using it in the wrong way. It is moderately toxic to dogs. It should not be consumed. If it is consumed, a doctor or poison control center should be contacted at once. There are six species in Apocynum. Three are more commonly used in North American gardens than the others. Apocynum androsaemifolium is called spreading dogbane, bitterroot, or fly-trap dogbane. A. androsaemifolium is native to Canada, the United States, and NE Mexico. Spreading dogbane looks a little like milkweed, but dogbane has branching stems, hairs on the underside of the leaves, and no hair on the stems. It does exude a milky sap when the stem is broken. 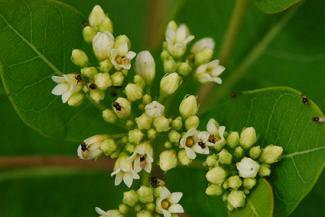 Spreading dogbane is a common wildflower in North America. Spreading dogbane is a perennial wildflower with green foliage and tiny, bell shaped pink flowers that occur on top of the branch tips. It grows to be one to three feet tall. It grows in open woodlands and woodland edges. It lives in USDA zones 4-8. It can grow in deep shade, partial shade, or no shade. It is not picky about the type of soil it lives in but requires well drained soil. It does not tolerate wet feet. Spreading dogbane is propagated by seeds and by rhizomes. Seeds should be sown in the fall and require a period of cold before they will germinate. Spreading dogbane should be divided in the fall. As a wildflower, spreading dogbane does not need much attention once it is established. Spreading dogbane is attractive to bees and butterflies. The tough, fibrous inner bark was used as cordage by Native Americans. It makes a nice edging or border for a flower bed. 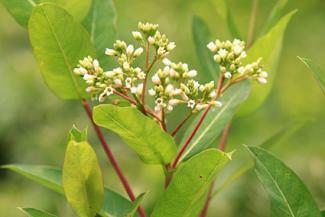 Apocynum cannabinum is called prairie dogbane or Amy root, hemp dogbane, Indian hemp, rheumatism root, or wild cotton. A. cannabinum is native to Canada and the United States. It is a wildflower that grows in open wooded areas, ditches, and hillsides. Prairie dogbane grows up to six feet tall. The stems are reddish and contain a milky substance that will cause skin blisters. The leaves are green and oval and have hair on the underside and a smooth top. It has white flowers from July to August that are pollinated by moths and butterflies. Prairie dogbane is an herbaceous perennial herb. Prairie dogbane grows in zones 4-9. 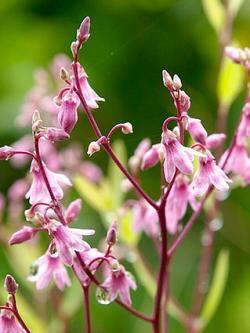 It grows in sunlight or dappled shade, although it does best in the sun. It will grow in most soils it is planted in, but prefers sandy, well drained soil. Prairie dogbane is drought tolerant but does better with medium watering. It can become aggressive and spread out of control. To grow from seed, plant the seeds 0.4 inches in the soil in the fall. They must go through a cold period to germinate so will germinate in the spring. You can also divide the rhizomes this plant makes and plant them to make new plants. This should be done in the fall. Prairie dogbane does not have any known pests or diseases and does not need much attention once established. Prairie dogbane is used for its bark and the root. The bark is used as cordage that is a substitute for flax. It will make very fine threads. The roots are used in herbal medicine. However, all parts of this plant are now considered poisonous and should not be eaten. They can cause cardiac arrest. This is a good plant to naturalize in a butterfly garden, rock garden, or natural garden. Apocynum sibiricum is called clasping dogbane. A. sibiricum is native to North America across all 48 states and Canada, according to the USDA's PLANTS Database. It has green leaves and green white flowers that attract lots of small insect pollinators. It blooms May through September. Clasping dogbane is a herbaceous perennial. It is grown through seeds or by division. It grows to a height of five feet and likes part shade. It grows in ditches and along roads as well as in prairies. Seeds should be planted in the fall because they need a period of cold before they will germinate. Division of rhizomes may be done in the fall as well. It has few pests or diseases and needs little attention once established. Clasping dogbane attracts insect pollinators so would be good in a butterfly garden, natural garden, or wild garden. It has a fibrous bark that is used to make fiber. Its leaves were used as a heart tonic by Native Americans. All parts of the plant are considered poisonous and should not be consumed. A. x floribundum is native to Canada, the United States, and northern Mexico. It is a hybrid, being a cross between A. androsaemifolium and A. cannabinum. It is called intermediate dogbane because of this. This is a perennial herb that grows 10 to 60 centimeters tall. It has green leaves with hair on the undersides and white to pink flowers. It blooms June to early August. This hybrid is naturally occurring but quite rare. It is grown like its parents, A. androsaemifolium and A. cannabinum. It lives in open woodlands, hillsides, and prairies. It requires sun to grow and prefers sandy soil. It is drought resistant but appreciates medium water. It cannot be grown from seed as it is a hybrid, but does reproduce by rhizomes and can be divided in the fall to produce new plants. Intermediate dogbane is so rare that there are no documented uses for it. It would work in a butterfly garden, rock garden, or natural garden. A. pictum is native to parts of China (Gansu, Qinghai, Xinjiang), Mongolia, Kazakhstan, Kyrgyzstan, and Tajikistan. It grows in marginal ground around the edges of arid regions. It can tolerate more salinity in the soil than most plants. It is used for its fiber and as a medicinal herb throughout its region. It has no English common name. A. venetum is native to Italy, Bulgaria, Turkey, Ukraine, Russia, Siberia, Central Asia, Iran, Iraq, Cyprus, Pakistan, Afghanistan, China, and Japan. Little is known about growing this plant in the garden and it has no English common name. However, an extract of its leaves is being studied as a treatment for mild depression and anxiety. Dogbane is an interesting family of plants that have herbal and cordage uses. It should not be consumed because it is considered poisonous but was used before modern medicine to treat a range of conditions, chiefly heart trouble. Dogbane looks nice in a butterfly garden, wild garden, or natural garden. 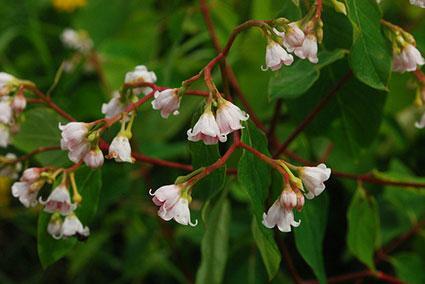 Common dogbane is easy to find in a nursery but some of the rarer species are not. They must be ordered as seed from places selling wildflowers like Prairie Moon Nursery.